Power Packs are the top module in a system and they have the main power for the flash stored inside with various levels of watt seconds (joules). The Packs usually have the adjustments for the output and the head jacks to plug the Flash Heads into. The Power Packs need to be powered by a Battery or AC Adapter. Most Packs can also use additional modules to be boosted to higher power levels or recycle faster when needed. The Classic Packs and the Next Generation Packs have two switches on top for the power selection. The Signature Series Packs have a round knob on top and offer more power serttings down to lower levels. The Action Packs are for stopping action and have a very fast flash duration. The PLSX is an awesome small Pack with settings at 6ws, 12ws 25ws and 50ws. 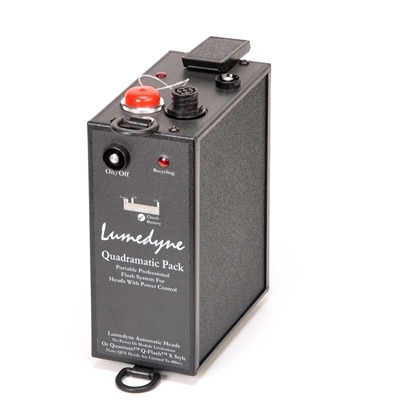 This is a super small and fast solution for photographers who need less power than they used to use but still want the quality of light that Lumedyne is famous for. This Pack is not modular but has a built in Lithium LiFePo4 battery inside of it. At full 50ws it provides at least 1000 flashes per charge and recharges in just over an hour. It gives many times more flashes at the lower power settings. 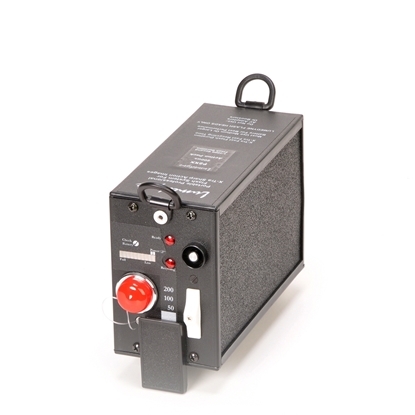 The P1NF is a low power solution for the modular Lumedyne system. Many existing Lumedyne Packs have the higher power settings from 50ws and higher, but this Pack offers the lower power settings of 3ws, 6ws, 12ws and 25ws. This is a great addition to systems that already have the higher power settings with their older gear and this can be used at higher ISO settings when you are working indoors but you still want the Lumedyne quality of light. 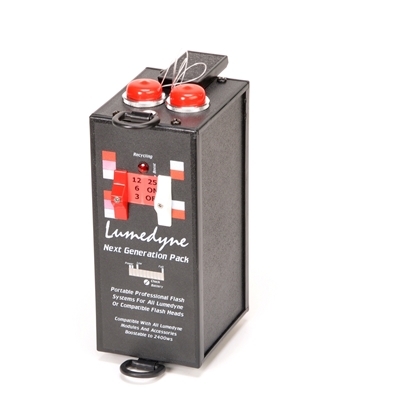 The Pack also has a battery gauge and works with all generations of Batteries, AC Supplies, Boosters and Speed Modules. The P2NX is a great addition to the modular Lumedyne system. Many existing classic Lumedyne Packs have the higher power settings from 50ws and higher, but this Pack also offers a lower power settings of 25ws. There is a switch to select fast or extra fast recycling times. The Pack also has a seven light battery gauge and works with all generations of Heads, Batteries, AC Supplies, Boosters and Speed Modules. 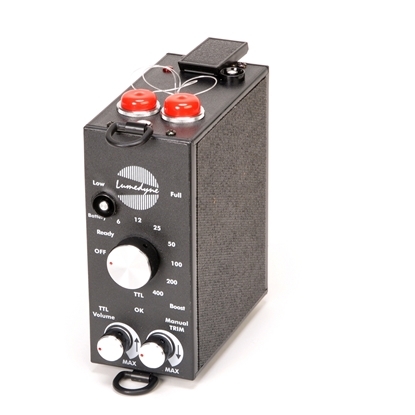 The P4NX is a powerful building block in the modular Lumedyne system. 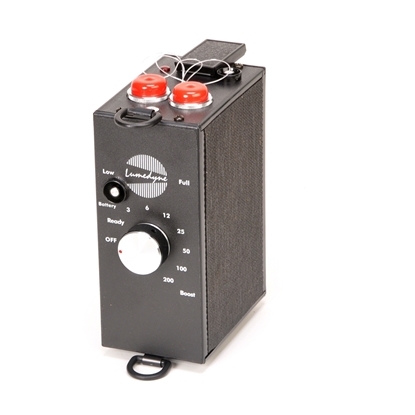 This Pack offers power settings from 50ws, 100ws, 200ws and 400ws. There is also a switch to select fast or extra fast recycling times. This is the basic workhorse for many location photographers who need high power to compete with daylight. The Pack also has a seven light battery gauge and works with all generations of Heads, Batteries, AC Supplies, Boosters and Speed Modules. Action Packs are designed to have an extremely fast flash duration. They freeze fast moving action better than any other brand of high power flash system because they have a faster t0.1 time till the flash duration is finished. The 200ws Action Pack has its fastest setting at its highest power, so 200ws is finished in 1/3000 second. The Pack has a seven light battery gauge and powers one Lumedyne Flash Head (Quartz Flashtube recommended) and it does give you the option of fast or extra fast recycling between flashes. Action Packs are designed to have an extremely fast flash duration. They freeze fast moving action better than any other brand of high power flash system because they have a faster t0.1 time till the flash duration is finished. The 400ws Action Pack has its fastest setting at its highest power, so 400ws is finished in 1/1500 second. It also has settings at 200ws and 100ws but they are slower. The Pack has a seven light battery gauge and powers one Lumedyne Flash Head (Quartz Flashtube recommended) and it does give you the option of fast or extra fast recycling between flashes. The 200ws Basic Signature Pack has seven settings from 3ws to 200ws on a single dial control. The Pack has a four light battery gauge and can run with fast or extra fast recycling times. 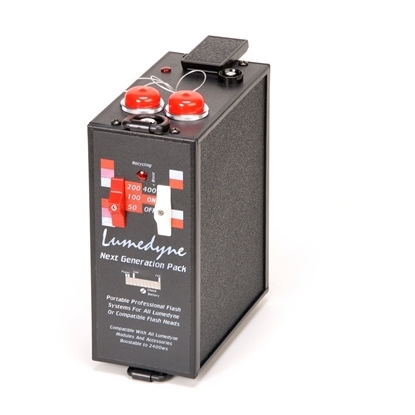 It is compatible with all sizes and styles of Lumedyne batteries and can power any of the Lumedyne Heads. The Pack can be boosted up to higher power or sped up with High Speed Modules and can run from most Lumedyne AC Power adapters. The 400ws Basic Signature Pack has seven settings from 6ws to 400ws on a single dial control. The Pack has a four light battery gauge and can run with fast or extra fast recycling times. It is compatible with all sizes and styles of Lumedyne batteries and can power any of the Lumedyne Heads. The Pack can be boosted up to higher power or sped up with High Speed Modules and can run from most Lumedyne AC Power adapters. The 200ws Deluxe Signature Pack has seven settings from 3ws to 200ws on a single dial control. There is a separate Trim Control to go smoothly between the f-stops also. The Pack has a seven light battery gauge and can run with fast or extra fast recycling times. Deluxe Signature Series Packs have TTL controls for film cameras and very few digital cameras which still use TTL like Hasselblad or Phase One (NOT Canon™, Nikon™ or Sony™ for example). 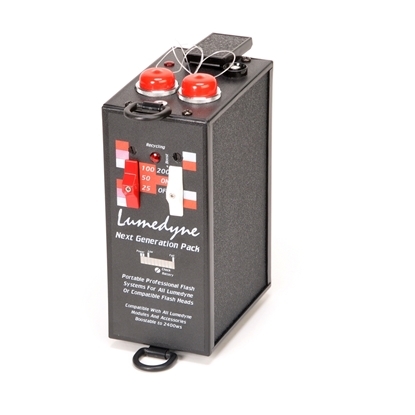 Signature Deluxe Packs are compatible with all sizes and styles of Lumedyne batteries and can power any of the Lumedyne Heads. The Pack can be boosted up to higher power or sped up with High Speed Modules and can run from most Lumedyne AC Power adapters. The 400ws Deluxe Signature Pack has seven settings from 6ws to 400ws on a single dial control. There is a separate Trim Control to go smoothly between the f-stops also. The Pack has a seven light battery gauge and can run with fast or extra fast recycling times. Deluxe Signature Series Packs have TTL controls for film cameras and very few digital cameras which still use TTL like Hasselblad or Phase One (NOT Canon™, Nikon™ or Sony™ for example). 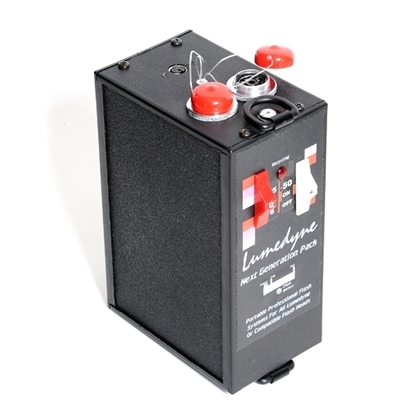 Signature Deluxe Packs are compatible with all sizes and styles of Lumedyne batteries and can power any of the Lumedyne Heads. The Pack can be boosted up to higher power or sped up with High Speed Modules and can run from most Lumedyne AC Power adapters. This 400ws Pack is designed to power one Quantum Q-Flash™ model X flash head (of any generation number) directly without needing any additional adapters because it has a Quantum™ style head jack on it already. It can power a second Q-Flash™ (while using the QF-42 or the HCQQ cable adapters) or a full power Lumedyne Head with the second head jack. It offers a recycle time twice as fast as the Quantum Qpaq-X™ and has all of the 400ws in one module. 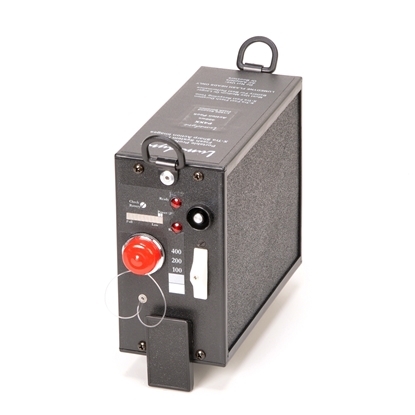 It connects to all generations and styles of Lumedyne Batteries and can be powered by our AC Power Supplies. It has super simple operation with power on/off, speed of recycling and battery gauge push buttons.